(US, Canada) A flavoured beverage consisting of water, lemon, and sweetener, sometimes ice, served mainly as a refreshment. (Britain, Australia, New Zealand) A clear, usually carbonated, beverage made from lemon or artificial lemon flavouring, water, and sugar. 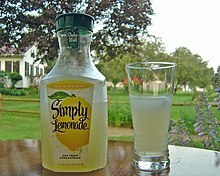 In locations where the meaning as a carbonated beverage is common, the still beverage is often called "homemade lemonade" or "old-fashioned lemonade". The terms "lemon(-flavored) drink" and "lemon(-flavored) beverage" generally denote any lemon-flavored drink.